But in a strange twist, policies could actually become more affordable for many people buying on the exchange. That's because the price spike means many enrollees will receive more generous premium subsidies, so they can now afford gold policies with lower deductibles. In the annual landscape report, the Trump administration highlighted many of the negative developments that will plague Obamacare next year. In prior reports, the Obama administration focused on how the premium subsidies make Affordable Care Act policies more affordable. 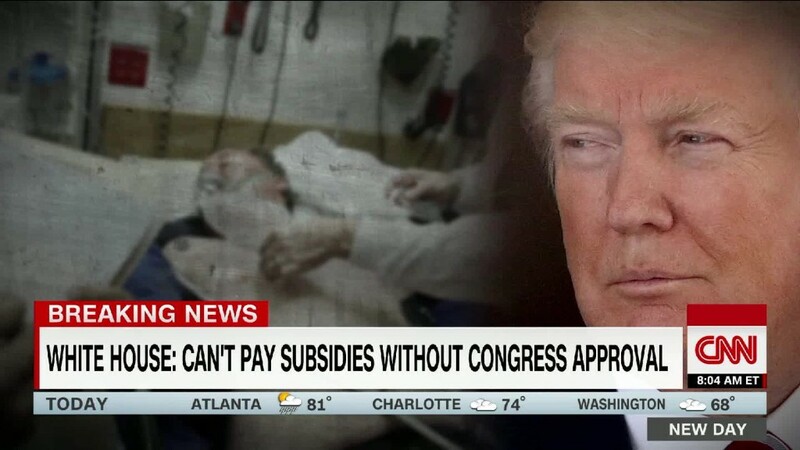 "This data demonstrates just how rapidly Obamacare's exchanges are deteriorating with skyrocketing premiums year after year, more than half of Americans with no more than two insurers to choose from, and the taxpayer burden exploding," said Caitlin Oakley, press secretary for the Department of Health & Human Services. The report covers the more than three dozen states that use the federal exchange, healthcare.gov. Open enrollment begins Wednesday and runs through Dec. 15 -- about half the length of prior periods. The steep rate hike means a 27-year-old will pay nearly $5,000 a year, on average, for the benchmark silver plan, upon which premium subsides are based. That's up from $2,600 when the Obamacare exchanges opened in 2014. This is before subsidies are factored in, however. Premiums are spiking again in part because President Trump stopped reimbursing insurers for another key Obamacare subsidy, which they are still required to provide by law. These cost-sharing subsidies reduce deductibles and co-pays for lower income enrollees. Insurers raised rates by as much as 38% just because the funding ended, though the amount varied widely by state, according to a recent analysis by the Kaiser Family Foundation. Most states directed insurers to raise the silver plan prices since premium assistance is tied to that metal level and the cost-sharing subsidies are only available to those purchasing silver plans. The big rate increase means premium subsidies will rise 45%, on average, to $6,660 a year. More than eight in 10 enrollees receive premium subsidies, which reduce their cost to less than 10% of their household income. A 27-year-old making $25,000 a year could receive an annual subsidy of nearly $3,300. That would bring his or her premium down to $1,650 a year if he or she enrolls in the benchmark silver plan. A family of four earning $60,000 a year could get an annual subsidy of $13,000, bringing their benchmark plan premiums down to just over $4,750. These more generous subsidies will make bronze plans -- which have lower premiums, but higher deductibles -- more affordable for many enrollees. And the higher level of assistance means that gold plans will actually be cheaper than silver policies in some markets. That's why it's particularly important for consumers to shop and compare plans this year. Some 29% of enrollees will only have one insurer offering policies, up from 20% this year and 6% in 2016. Eight states will have only one insurer, up from five states this year. Just over 130 insurers will be on the exchanges in 2018, down from more than 230 two years ago. Many large, publicly traded insurers, including Aetna (AET) and Humana (HUM), have exited Obamacare, while Anthem (ANTM) has greatly downsized. Are you shopping for individual policies either on or off the Obamacare exchanges for 2018? Tell me about it. You could be featured in an upcoming CNNMoney story.